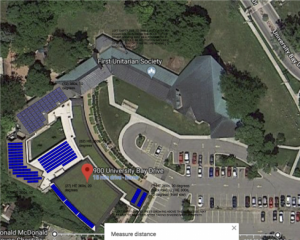 FUS is going solar in 2019! By fall 2019, we’ll have an array in place that will provide more than a quarter of the electricity we consume on the FUS campus. The new array will be placed on the flat-roofed portions of FUS and outside the green roof on the Atrium addition. The Landmark building will be unaffected. The 79 kW system will generate about 90,000 kW-hours of electricity annually. The system’s sticker price of $170,000 will be reduced by a $20,000 grant already awarded from RENEW Wisconsin, as well as donations from the 2018 FUS Capital Campaign. The remainder of the cost will be further reduced, about 50 percent, by the tax treatment discussed above. FUS will pay the tax sponsor for several years (to be determined) in order cover principal and interest on the bonds; those payments will amount to less than what the congregation would have paid MG&E for the electricity generated. Eventually, the congregation will own the array outright, and the electricity will be free. The solar project has been organized by FUS staff and the Sustainability Ministry Team. The team has additional good news on energy as well: Efficiency improvements from operational and equipment upgrades to the geothermal heating system should save another quarter of FUS’s electricity use. Together with the solar project, the efficiency improvements will save money and get FUS toward the team’s goal of carbon net neutrality or better. The project is made possible thanks to a collaboration with the Madison-based Legacy Solar Co-op. The co-op will partner with an individual investor, in order to take advantage of tax credits available for solar energy projects. (FUS does not pay income tax so cannot trigger these credits on its own.) The co-op will also sell bonds to Wisconsin residents to provide a share of installation costs. The bonds, which pay 4-6 percent interest, are available to FUS members as well as the general public. For more information on purchasing bonds or becoming a tax sponsor, you can read details here or contact the co-op directly. Before the solar array can be installed, the aging flat roofs are being replaced. That roof work, totaling approximately $150,000 is being funded primarily by a private bequest and a donation from the FUS Foundation. For more information on the solar project, contact Eric Sundquist. For more information on the ministry team, contact Pat Eagan.